It was a thrilling Formula 1 season in which Lewis Hamilton and Nico Rosberg's title battle went to the final race in Abu Dhabi, with the Briton finally clinching his second world championship with his 11th win of the year. BBC Sport has compiled all the key numbers for the 2014 season, with a strong focus on Hamilton and Rosberg as well as some interesting numbers on the other drivers on the grid. Find out who was the best starter, which driver accumulated the most penalties and who completed the most laps. As well as looking in detail in 2014, we also put Hamilton's achievements in a historical context by seeing how he compares to previous champions. 15: World championships won by British drivers (Mike Hawthorn, 1958; Graham Hill, 1962 and 1968; Jim Clark, 1963 and 1965; John Surtees, 1964; Sir Jackie Stewart, 1969, 1971, 1973; James Hunt, 1976; Nigel Mansell, 1992; Damon Hill, 1996; Lewis Hamilton, 2008 and 2014, Jenson Button, 2009). He is the only driver to win at least one race in his first eight seasons in F1. Alain Prost, Michael Schumacher and Sebastian Vettel all raced for parts of a season before going on a similar run. (Prost took part in 11 races in 1980, before winning every year from 1981-90. Schumacher took part in six races in 1991, before winning every year from 1992-2006. Vettel took part in eight races in 2007, and won at least one race from 2008-13, but failed to claim a victory in 2014. 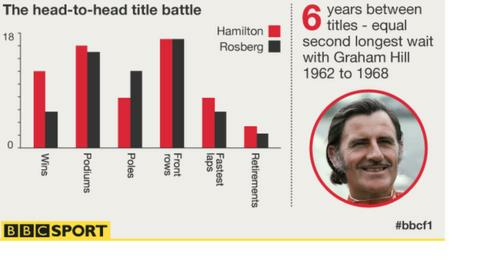 He becomes the fourth British multi-F1 champion. The others are: Graham Hill (1962, 1968), Jim Clark (1963, 1965), Sir Jackie Stewart (1969, 1971, 1973). He has 33 wins from 148 starts (22.30% success rate). Drivers with a better win percentage: Juan Manuel Fangio, Alberto Ascari, Jim Clark, Michael Schumacher, Sebastian Vettel, Sir Jackie Stewart, Ayrton Senna, Alain Prost, Sir Stirling Moss. Only man to finish on the podium in his first nine grands prix. Nigel Mansell was 32 when he won his first GP in 1985 and went on to win 31 of them. Hamilton is 29 and has 33 race wins. He has one more race win than Fernando Alonso (the Spaniard was aged 32 when he won his last race). The only drivers to have won more grands prix than Hamilton are Schumacher (91), Prost (51), Senna (41) and Vettel (39). 1: The German missed the chance to become only the second son-of-a-world-champion to win the title himself. His father, Keke, won in 1982. The only father-son pairing to both become world champions remains Graham and Damon Hill. Damon won the title in 1996 with his father, Graham, triumphing in 1962 and 1968. 10: The German is one of 10 drivers to fail to win a race when defending their world title. The others are: Juan Manuel Fangio (only competed in two races in 1958), Sir Jack Brabham (1961), Phil Hill (1962), John Surtees (1965), Mario Andretti (1979), Jody Scheckter (1980), Nelson Piquet (1988), Damon Hill (1997) and Jacques Villeneuve (1998)NOTE: Mike Hawthorn, the 1958 champion, retired before being killed in a road accident in January 1959. Jochen Rindt, the 1970 champion, was killed in qualifying for the Italian Grand Prix that year. Nigel Mansell (1992 champion) and Alain Prost (1993 champion) did not compete in 1993 and 1994 respectively. 20 years and 67 days: Button became the youngest driver to score world championship points when he finished sixth at the 2000 Brazilian Grand Prix. His record has since been broken by Daniil Kvyat, Sebastian Vettel and Jaime Alguersuari. However, they first gained points for finishing ninth, eighth and ninth respectively after points-scoring positions were extended to the top eight in 2003 and top 10 from 2010. Button remains the youngest driver to finish in the top six. 59: Years since one of their drivers (Juan Manuel Fangio, 1955) last won the world championship. They did not run a works team from 1956 to 2009. Their engines did power McLaren's Mika Hakkinen to the title in 1998 and 1999, plus Brawn's Jenson Button in 2009. 11: The number of 1-2s they achieved in 2014 - a new F1 record. Biggest improvement in 2014: Williams won 320 points in 2014 and finished third in the constructors' championship. In 2013 they managed only five points, their worst season in F1. Only Marussia and Caterham, who failed to score, finished behind them in the constructors' championship. Biggest drop in 2014: Last year Lotus picked up 315 points and finished fourth in the constructors' championship. In 2014 they only scored only 10 points. Click here to see all the graphic stats in text form.